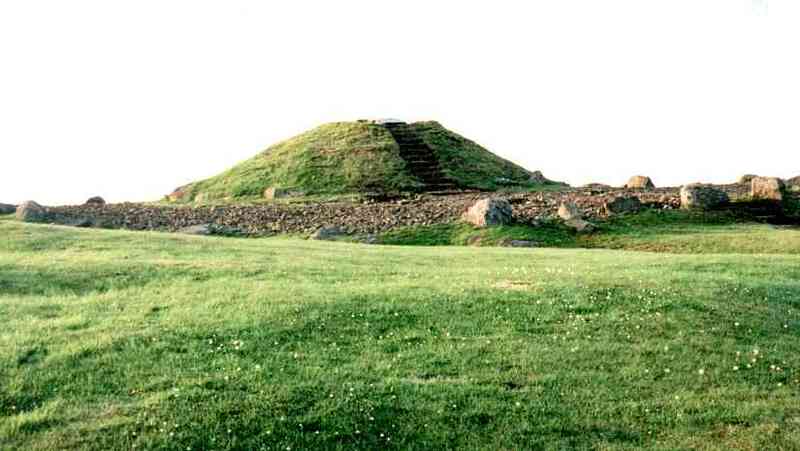 Cairnpapple Hill is just north of Bathgate, near Edinburgh. At the summit is a complex site which was in use for more than 1000 years from around 2800BC. In its first use, during the late Neolithic period, an arc of seven holes were dug and cremated human remains placed in most of them. Three sockets--which, it is assumed, were probably for megaliths--lie in the centre of the arc. Fragments of two stone axes from Langdale in the Lake District and from Penmaenmawr Mountain in North Wales (judging by the composition of the stone from which they are made) were found in the early layers of the site, indicating that there was communication and trade between the local community and more distant groups. At a later period, twenty-four standing stones were arranged in an oval, a ditch was dug outside this oval (with entrances at the north and south), and a bank built up beyond the ditch. The total diameter of this henge was around 200 feet. A very few fragments of beaker pottery and some cremated bone were found from this period. Within the henge a rectangular grave was cut in which was found fragments of beaker. A second grave was marked with a standing stone and surrounded by an arrangement of smaller stones. No bones were found in either of these graves--any that were there would have been destroyed by the acid soil. 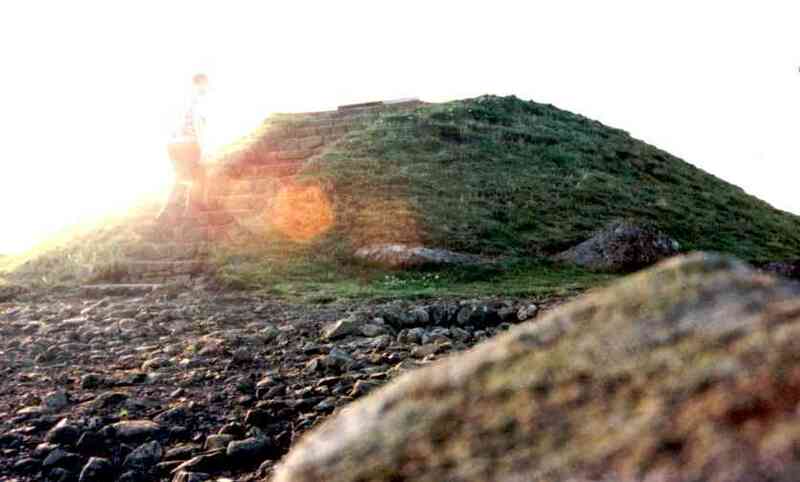 Later still a cairn was constructed within the henge, probably using the standing stones as material for the kerb. (Twenty-one stones with dimensions that match the socket holes of the circle were found in the kerb. These stones were up to 9 feet in length.) This cairn covered two Bronze Age cist burials. A cairn with double the diameter was built later. This covered two cremations covered by urns which were dated to the late Bronze Age. Finally, four graves were dug in the ditch area. These are generally assumed to be Iron Age, although there are no artefacts to definitely date them and any bones would have been destroyed by the acid soil. 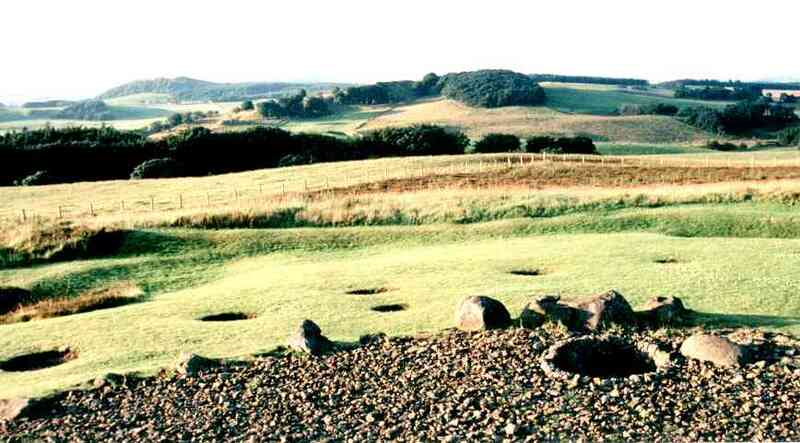 The current mound is a reconstruction representing the original Bronze Age cairn.